Black Friday is ignored at our house. There is nothing I want or need badly enough to engage in the shopping madness that seems to begin earlier and earlier each year. Instead, I usually take advantage of the long Thanksgiving weekend to get the Christmas decorations up, and browse magazines and cookbooks for holiday menu ideas. I usually end up with enough options to bake 24/7 from December 1 to Christmas Eve! After several years of too many late nights in the kitchen trying to make just one more batch of cookies or dipping 300 coconut bonbons in chocolate, I’ve learned to scale back a bit. Maybe more than a bit. Thankfully, there many great artisan and gourmet foods available to help round out holiday tables or fill gift lists. The possibilities seem endless from savory to sweet at price points suitable for any budget. The food producers further tempt us with holiday gift baskets and seasonal flavors. 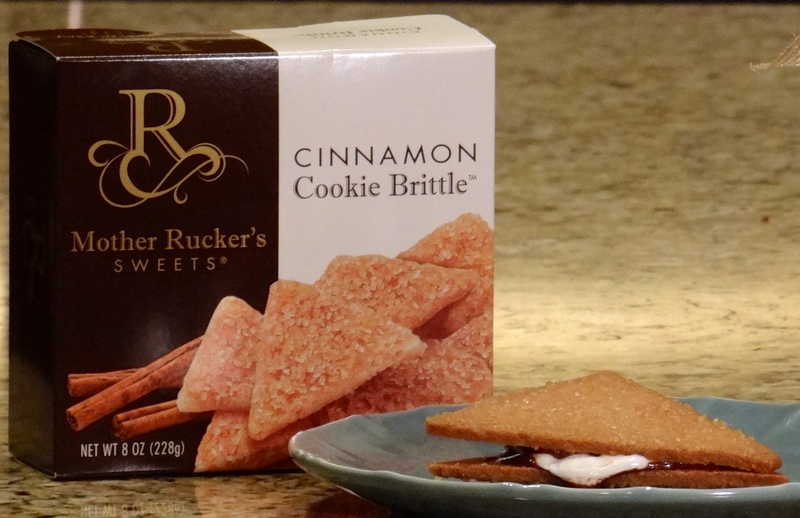 We shared Mother Rucker’s Cinnamon Cookie Brittle with you a while back because it knocked us out with its delicate spicy crunch. When we saw the holiday flavors Mother Rucker had baked up, we were all in. It was hard to choose from cocoa, eggnog, gingerbread and peppermint flavors, but peppermint won out. This cookie should definitely be on your shopping list. It has the same delectable crispness that we enjoyed in the cinnamon flavored cookie brittle, the peppermint and rich butter flavors are perfectly blended, and the glittering crunchy sugar on top is totally in sync with the sparkle of the season. The cookies were superb with a cup of hot chocolate! 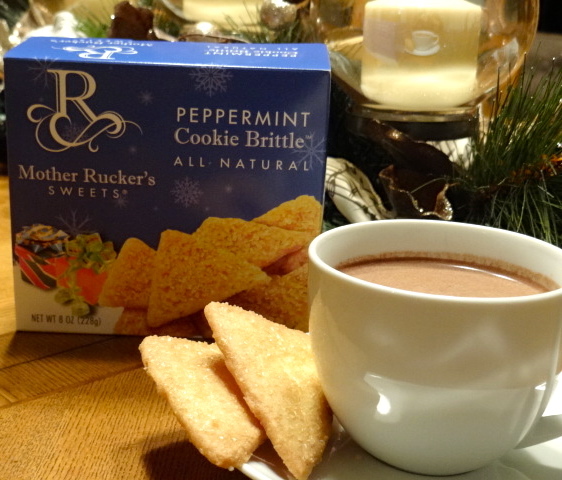 Based on our taste tests of cinnamon and peppermint cookie brittle, it’s hard to imagine you could go wrong with any of Mother Rucker’s cookie brittle flavors, and it would be a shame to miss the special seasonal cookies. We found them at Central Market, but you can order them directly from Mother Rucker’s website. I’ve had a couple of occasions to order bouquets from 1-800-flowers this year, and I’ve been tempted to add a sweet treat to go along with the flowers. I’ve also had a couple of occasions when I’ve received mail-order sweets that were less than exciting, so I wasn’t sure about sending something sight unseen, or in this case taste untested. What to do? Research and tasting, of course! Cheryl’s Cookies is part of the 1-800-flowers brand family, but has artisan roots. Success takes many forms for food artisans. Some revel in maintaining personal relationships with their customers, making their products in small batches, and retaining a high level of personal control over their business. Others, by plan or providence, grow their businesses to the point where they bring on partners, merge or are bought out by other companies. Cheryl’s falls into the latter category. College roommates Cheryl Krueger and Caryl Walker opened Cheryl’s Cookies in Columbus, Ohio in 1981 in a small storefront with six cookie flavors. The business grew and the product line expanded to include fancy cut-out cookies with Cheryl’s buttercream frosting, brownies and cakes. In 2005, Cheryl & Co. became part of the 1-800-flowers brand, while still maintaining their own retail outlets, internet business, and a business gifts division. Cheryl’s website offers a nice variety of of cookie collections for many occasions. We created our own box with buttercream frosted, chocolate chip, chocolate chocolate chip, sugar, and oatmeal raisin cookies. All were good, but the buttercreams were far and away our favorites, with great texture and very tasty frosting. 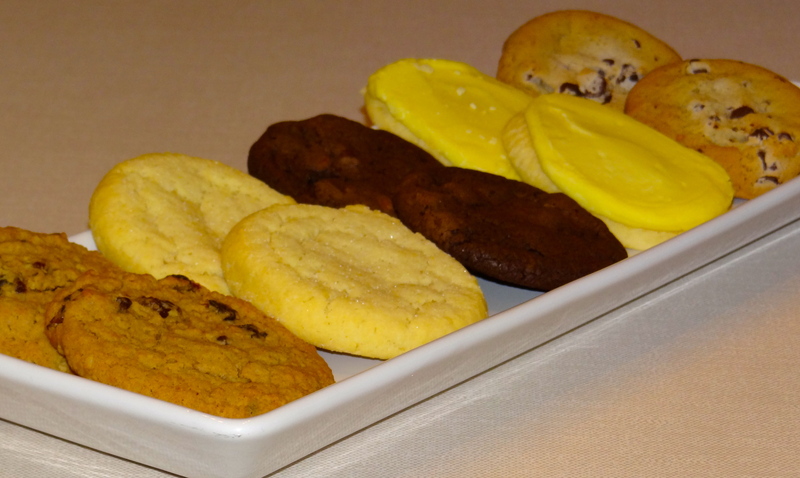 We love Cheryl’s cookie club with 6 deliveries per year to the recipient of your choice (or yourself). The cookies are individually wrapped and sealed to retain freshness. They have a fall collection of gift boxes and tins available now. You can add your own decorating panache to Cheryl’s cookies by ordering ready-to-frost holiday cut-out cookies and a tub of vanilla, cinnamon, or mint buttercream frosting. Be sure to check out their $5 cookie greetings, a single cookie in a gift box sent with your personal message. A huge red, white and blue salute to Cheryl’s for offering free shipping to APO and FPO addresses! Jamie Parham founded J&M Foods with the help of her daughters, Janis and Melanie, more than twenty years ago. It is inspiring to see a family turn a passion for their traditional family foods into a successful business, and this mom and daughters team did exactly that, using a 100 year-old recipe for cheese straws. Today, they have four varieties of cheese straws: original, asiago cheese, bleu cheese and jalapeno. They also make traditional and tea cookies, and we tried their key lime tea cookies. Tea cookies sometimes seem to be the underrated segment of the cookie kingdom. They aren’t stuffed with chips or nuts, or slathered with icing, but their light, crisp taste and texture have their own special appeal. 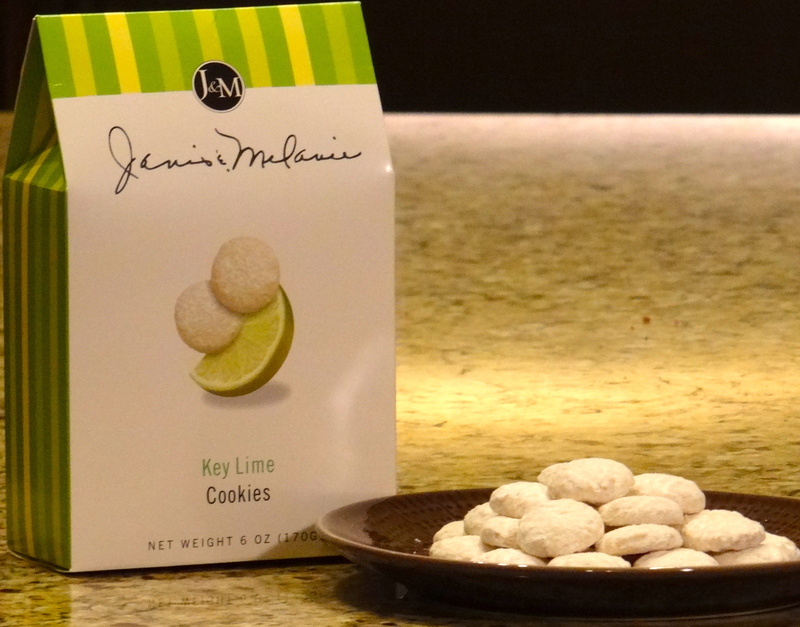 J&M’s petite key lime cookies have a very nice balance of sweet and tart, and are dusted with confectioners’ sugar. Although we enjoyed them straight from the box, they would be great with coffee or tea. The Parham family takes pride in using natural ingredients and they have gone the extra mile to assure their customers of quality by being certified by the Safe Quality Food Institute. The certification provides confidence that food is handled, prepared, and processed in compliance with international food safety requirements. J&M’s website offers an online store for ordering their tea cookies, traditional cookies, and cheese straws. We enjoyed the key lime tea cookies so much, we may have to try the white chocolate key lime cookies next! The cheese straws would make excellent holiday buffet additions or hostess gifts. There are attractive holiday gift tins for family or business associates. Jamie, Janis, and Melanie can be very proud of their family’s great line of products! Karel (aka “Mother”) Rucker’s co-workers and colleagues were beneficiaries of her passion for baking before she “turned pro”. Karel finessed her family recipes and created new ones for cookies, brownies, truffles and other confections. In 2006, Karel and a colleague, Greg Raynes, launched Mother Rucker’s Sweets in Fort Worth, Texas. The company has grown its catalog of cookies and sweets to an impressive array of specialty and corporate gift boxes. Karen and I found Mother Rucker’s Cinnamon Cookie Brittle on Central Market’s shelves. Opening the foil-sealed package released the spicy cinnamon aroma, instantly alerting us that these unassuming little cookies were going to be something really special. This is one treat you will simply have to try yourself because words can’t convey how crisp and delicious they are. 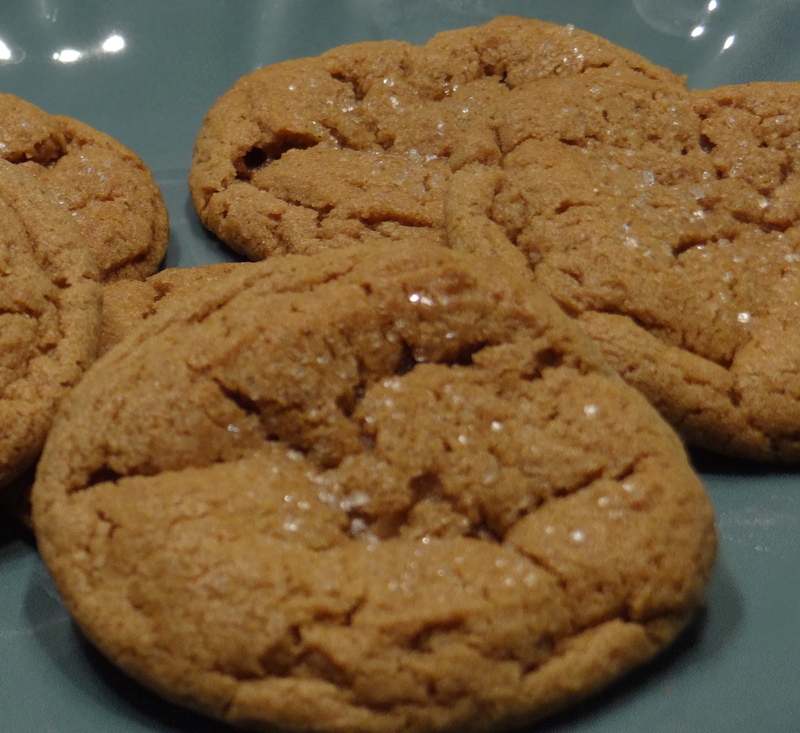 The cookies are buttery rich with a topping of crunchy sugar. Although stellar on their own, we immediately starting thinking about how they could be used. Allen immediately thought they would be excellent with coffee (his highest dessert accolade). We decided they would be fantastic crumbled over ice cream. And then — we made s’mores! We spread one cookie with melted dark chocolate, topped it with a toasted caramel and sea salt marshmallow and another cookie. Dessert heaven! I don’t know if I will ever be able to eat s’mores with ordinary graham crackers again. The only thing better than finding these cookies is knowing there are two more flavors to try–almond and lemon. And try them we will. 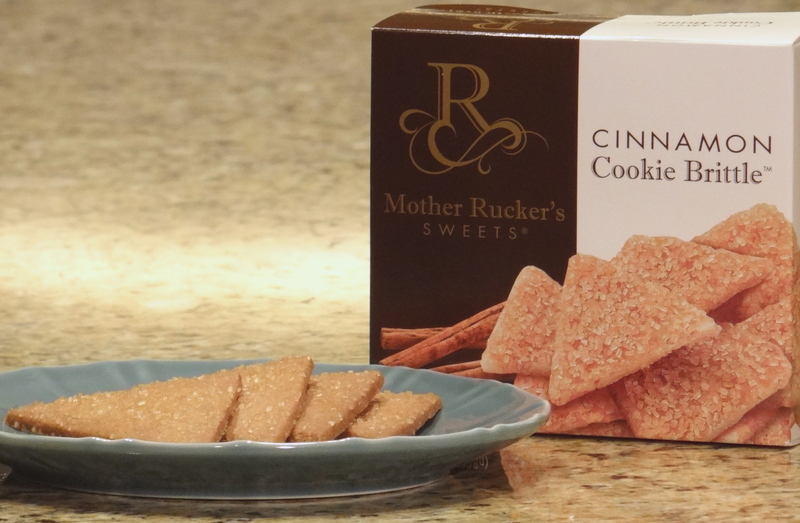 Mother Rucker’s website has more dessert ideas for their cookie brittles, including cobblers using cinnamon cookie brittle with apple pie filling, almond brittle with cherry pie filling and lemon brittle with blueberry pie filling. How quick, easy and fantastic would those be? Now, that is a corporate slogan we can all get behind, right? 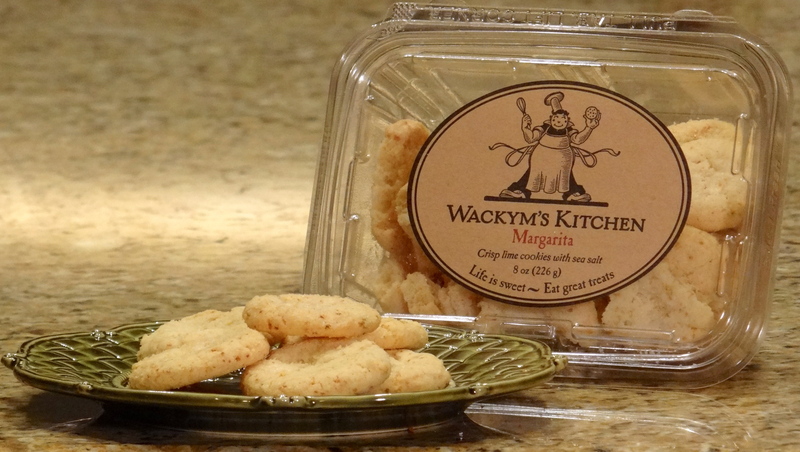 Wackym’s Kitchen Margarita Cookies were an impulse buy during a trip to Central Market, and these sweet and savory treats exceeded our expectations. Margarita flavored desserts are plentiful, especially in Texas and the Southwest. So often, they are super-sweet confections that have more lime than margarita flavor. Not so with these cookies! A serious dash of salt balances the lime sweetness, reminding us of (surprise!) a margarita. The cookies are perfectly crisp and rich, and could easily become an addiction. No hangover worries, though! Wackym’s cookies are made from fresh ingredients with no artificial flavors or colors. 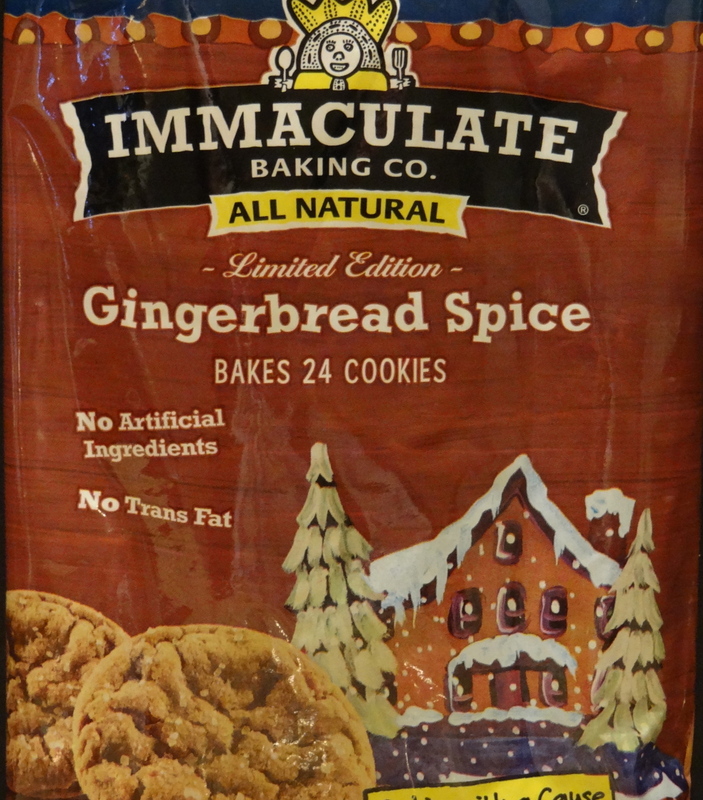 The website offers seven flavors in addition to margarita: lemon, peanut crunch, chocolate snicker doodle, mocha chocolate chip, oatmeal walnut currant, salted caramel, and rosemary cornmeal shortbread. Is your mouth watering yet? The gift collection is very reasonably priced with some classy options, including a keepsake bamboo box stuffed with seven bags of their most popular cookie flavors. Even better, Wackym’s Kitchen will bake to your order, so corporate gifts or special occasion cookies are just a mouse-click away. 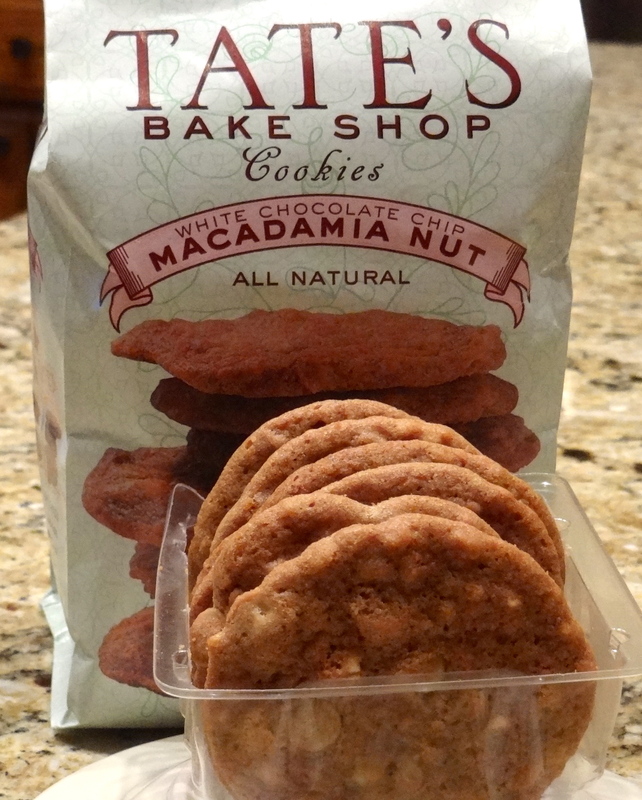 Wackym’s Kitchen cookies are also sold at numerous retailers in Texas. Paul Wackym, the Chief Cookie Officer, was a food product development manager for Neiman Marcus before he opened his own kitchen. What a training ground! As he learned the business end of successful food development and production, he realized he wanted to have his own products. He develops his own recipes, using the foods he loves, working with flavor combinations that intrigue him, and some that baffle him! Paul is also the marketer-in-chief for his delectable treats. Wackym’s Kitchen’s Facebook page lists his promotional appearances at various markets in Dallas and surrounding areas. I hope I run into him before his seasonal Hatch Chile Chocolate Chip cookies are gone!